This user’s guide for the Office Environment Assessment Tool (OEAT) will help you work successfully with OEAT. Before you use this guide, we recommend that you perform the planning steps described in Office 2010 application compatibility guide and that you are ready to run OEAT to scan your organization’s client computers for add-ins and applications that interact with Microsoft Office. A new version of OEAT is available as of July 2011. 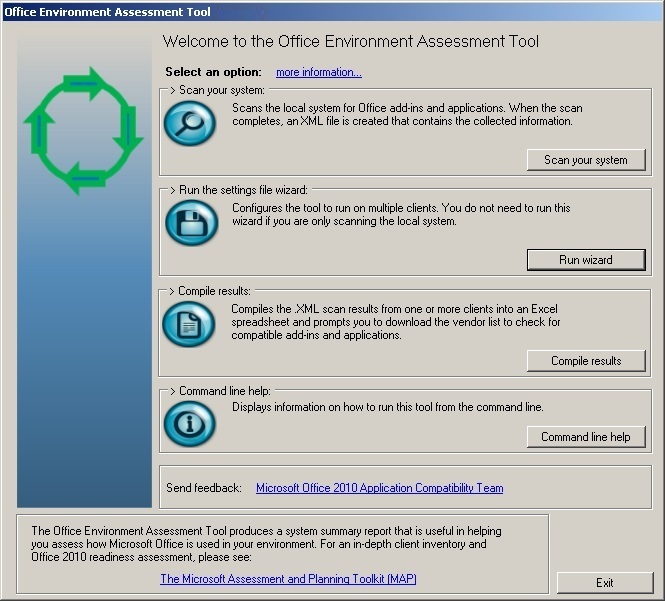 To download the Update 1 version of OEAT, see Office 2010 Tool: Office Environment Assessment Tool (http://go.microsoft.com/fwlink/p/?linkid=171092). OEAT is a free downloadable executable (.exe) file that scans client computers for add-ins and applications that interact with Microsoft Office 97, Microsoft Office 2000, Microsoft Office XP, Microsoft Office 2003, the 2007 Microsoft Office system, and Microsoft Office 2010. You use OEAT during the assessment phase of your application compatibility and remediation project, which is described in detail in Office 2010 application compatibility guide. The following figure shows how OEAT fits into the overall process of assessing application compatibility. OEAT checks a predetermined list of folders and registry locations on each client computer for the presence of add-ins that are used for Microsoft Outlook, Microsoft Word, Microsoft Excel, and Microsoft PowerPoint. The add-in types include Automation add-ins, COM add-ins, VBA add-ins, and application-level add-ins created by using Visual Studio. Optionally, OEAT runs a passive scan against client computers to monitor for applications that call Office APIs. The passive scan works by enabling auditing on certain registry keys (over a configurable period of hours or days) that are used when Office APIs are called. Based on this auditing, OEAT can determine which applications are calling Office APIs. This includes each executable name and version, and the date and time that the executable was run. When the auditing period is complete, OEAT disables auditing on the registry keys. You can customize how OEAT runs by using a built-in wizard to generate a settings file (Settings.xml). The options include whether to run a passive scan, whether to scan the client computer silently (with no user interaction), and the UNC path or local path where the scan results are saved. You deploy Settings.xml together with OEAT.exe, either in a central shared folder or deployed to individual client computers by using products such as Microsoft Systems Management Server (SMS) or Microsoft System Center Configuration Manager. You can also deploy an execution script (based on sample that is provided later in this article) to automate invoking the command-line version of OEAT from each client computer. For each client computer that is scanned, OEAT generates a uniquely named .xml file that contains details about add-ins and applications that are detected, and also system information about each client computer, such as drive space, memory, and the versions of Office and Windows that are installed. OEAT can save each .xml file to a central shared folder, or you can use System Center Configuration Manager to collect .xml files saved on each client computer. When all client scans are complete, you can use a function within OEAT to compile the .xml scan results for each client computer into an Microsoft Excel spreadsheet. As part of this compilation, OEAT can compare the discovered add-ins and applications against the list of compatible add-ins that are tracked by the Microsoft Independent Software Vendor (ISV) Application Compatibility Visibility Program. You can then use the resulting spreadsheet to analyze and prioritize add-ins and applications for testing and remediation. OEAT has been updated as of July 2011. The Update 1 version is available at the Microsoft Download Center (http://go.microsoft.com/fwlink/p/?linkid=171092). Passive scanning works in all languages. Scan result files are named by using a GUID instead of a MAC address. This change eliminates naming conflicts that can occur in some environments. When compiling scan results on a computer that does not have Internet access, OEAT can use a local copy of the vendors list (vendors.xml) that has been downloaded from another computer. Scan result files that are generated by the previous version of OEAT are not compatible with the newly released version. You must scan clients by using the new version of OEAT. This section describes the requirements for running OEAT for scanning client computers and for managing the resulting data. If you configure Settings.xml to enable passive scanning, each user account that runs OEAT must be a member of the Administrators group on the local computer. This membership is required so that the user’s account has permissions to enable auditing on registry keys for Word, PowerPoint, Excel, and Microsoft Outlook CLSID Automation keys. There are two workarounds available if you want to run passive scanning on client computers where users are not local administrators. For more information about these workarounds, see Troubleshooting OEAT errors later in this article. The computer must have access to the Internet to download the latest compatibility data from the ISV Application Compatibility Visibility Program. If the computer does not have Internet access, use the procedure that is described in Compile the scan results to download a copy of the vendor data (vendors.xml) from another computer that has Internet access. This section describes the tasks that you perform when you deploy OEAT. The following flowchart shows the tasks in the process. Each task corresponds to a heading in this article. Managed deployment Use System Center Configuration Manager or Systems Management Server to distribute OEAT.exe and its related files to each client computer. For additional guidance, see the blog post Deploying Office Environment Assessment Tool (OEAT) with ConfigMgr (http://go.microsoft.com/fwlink/p/?LinkId=225020). Group Policy deployment Use Group Policy to deploy OEAT.exe and its related files to each client computer, and configure Settings.xml to save the scan results to a shared folder. Unmanaged deployment Copy OEAT.exe and its related files to a shared folder and provide instructions to users for running OEAT. For example, you can e-mail a link to a script that launches the command-line version of OEAT, or you can provide step-by-step instructions that describe how to launch the OEAT user interface and run the scan. Configure Settings.xml to save the scan results in a shared folder, or instruct users to e-mail the scan results. You can perform a passive scan only if you provide a script or instructions for launching OEAT from the command line. Running a scan by using the OEAT user interface will not invoke a passive scan, even if you configured OEAT to run a passive scan in the settings file (Settings.xml). The command-line parameters for OEAT are available in OEAT command-line parameters later in this article. After you download OEAT, you can customize how OEAT runs by creating a settings file that specifies options such as passive scanning and the location (local or shared folder) where the results files are stored. You can create the settings file by using a wizard that is launched from the OEAT user interface. When you complete the wizard, OEAT creates the settings file (Settings.xml) in the same folder as OEAT.exe. Running the settings wizard is optional. However, if you do run the wizard and create a settings file, make sure that you distribute Settings.xml together with OEAT.exe. Double-click OEAT.exe. The OEAT user interface appears. In the Run the settings file wizard section, click the Run wizard button. On the Welcome to the OEAT - Setup Wizard page, click Next. On the Environment Scanning Information page, click each more information link to view a list of the items that are scanned on each computer. To continue, click Next. Select Yes to perform a passive scan, if you want, and then specify the length of time that auditing will be enabled on registry keys that are used by Office API calls. Passive scanning identifies external processes that automate Office applications, such as a solution that automates Excel to create a workbook and load data into it. We recommend that you select this option when you do not have a clear inventory of solutions that interact with Office applications. Choose a time period that is long enough to collect a representative sample of solutions yet short enough to finish before the clients restart, which will reset the auditing period. Select the Run hidden (silent) on the client while scanning check box if you want the scan to run in the background without user interaction. Click Next. In the Results Folder Location page, type the local path, mapped drive, or UNC of the share to which scan results will be saved. For example: \\server name\share name\results. Click Next. On the Finished page, click Finish. Verify that Settings.xml was created in the same folder as OEAT.exe. To automate the scans performed by OEAT, you can create a script that executes OEAT.exe from the command-line and saves the script in the folder that contains OEAT.exe. In the script sample that follows, make sure that you replace <server> and <share> with the server and shared folder that contains OEAT.exe. You can distribute the script to designated users as a logon script or by another method. Regardless of how you distribute the script, it must run with administrative rights on the local computer. The following is a JScript code sample that you can edit to use in your environment. //              UNC share with the SCAN switch. Deploy OEAT by using the method that you chose in Choose a deployment method earlier in this article. If you chose passive scanning, make sure that you wait until the auditing period has passed before you try to collect or compile the scan results. Also, note that if a client computer is restarted while a passive scan is taking place, the auditing period is reset. After the scan results are collected in a central folder, use one of the following procedures to compile OEAT scan results into an Excel spreadsheet. If the computer that contains the scan results has Internet access, you can compile the scan results by using OEAT on that computer. If the computer does not have Internet access, or if proxy issues are preventing OEAT from downloading the vendors.xml list, you can install OEAT on a different computer that does have Internet access, and then copy the downloaded vendors.xml file to the computer where the scan results are located. Navigate to the folder that contains the scan results and the OEAT.exe file. On the Welcome to the Office Environment Assessment Tool page, click Compile results. A message box prompts you to choose whether to download the latest vendor list. Click Yes to download the vendor list. A window opens and displays a progress bar that shows the progress of the compilation. The file OEAT Report.xlsx is automatically launched in Excel when the compilation is completed. Install OMPM on any computer that has Internet access and that meets the requirements described earlier in Requirements for managing OEAT. On the Welcome to the Office Environment Assessment Tool page, click Scan your system. After the scan is completed, click Compile results. A message box prompts you to choose whether to download the latest vendor list. Click Yes to download the vendor list, and then close Excel file that opens automatically after the compilation is complete. In the folder where you installed OEAT.exe, locate the file that is named vendors.xml, and then copy vendors.xml to the OEAT management computer that does not have Internet access. Be sure to copy the file to the same folder where OEAT.exe and the scan results are located. On the OEAT management computer, double-click OEAT.exe. A message box prompts you to choose whether to download the latest vendor list. Click No. OEAT compiles the scan results by using the vendors.xml file that you manually copied. This section describes the contents of the OEAT report and provides some examples of how you can best use the results data. SummaryReport This worksheet contains summary information that will help you determine whether your scanned client computers are ready for Office 2010. The worksheet includes data on average free space, processors, computer manufacturers, Windows installations (including service pack levels), and Office installations. The resulting data could be interesting from a configuration management perspective in that client computers might not be running the versions of Office or Windows that you expect. MicrosoftOfficeAddins This worksheet contains a list of all add-ins that are installed with Office. AddinsNotShippedWithOffice This worksheet contains a list of all add-ins that are not included with Office. Much of your assessment and planning will come from this report. You can sort the list by application, view the last accessed or modified dates, and view the number of client computers on which the add-in was detected. You can also compare version numbers of the same add-ins to determine whether some subsets of the client computers are out-of-date, which could indicate an issue with configuration management processes in your organization. UNKNOWN The add-in is currently not in the Microsoft vendor list of Office 2010-compatible add-ins. Therefore, the status of this add-in is unknown. Note that this status could change as new vendor data is made available to OEAT. Each time that you compile the spreadsheet, you have the option to download new vendor data. PARTIAL MATCH OEAT reports this status in two cases: OEAT found a match for the vendor name only. Or, OEAT found a match for the vendor name and product name, but the version number did not match. Use the link provided in the URL column to check the vendor list for compatible add-ins from the vendor. EXACT MATCH This status is shown when the vendor name matches, the product name matches, and the version number of the add-in is equal to or greater than the version that was reported by the vendor. The Compatibility column is not shown if you choose not to download compatibility data when prompted in the final version of OEAT, or if you are using the beta version of OEAT. You can download the final version of OEAT from the Microsoft Download Center. On the MicrosoftOfficeAddins or AddinsNoShippedWithOffice tab, in the count column heading, click the down arrow. Point to Number Filters, and then click Top 10. Adjust the AutoFilter if you want, and then click OK. Although you might want to study possible compatibility issues for each application in Office, at first you can focus on only one application. You can select to view the data from one Office application — such as Excel in the app column — and get a list of only the add-ins and applications that interface with Excel. After you have filtered the list by application and by the top 10, you can again filter the list of applications that are UNKNOWN or PARTIAL MATCH in the compatibility column. By using filters again, you can also remove from the list all add-ins that are already known to be compatible with Office 2010. Study the version information From the items reviewed, check the version of the add-ins or applications. Do you already have the most recent version supported by the vendor? Is the application fully deployed? Can you contact the vendor to verify the latest version? Note the last access date Determine if an add-in or application was used in your environment recently. If it has an old access date, you can check the systems that report that particular add-in in the RawData worksheet to see whether it is used by current users. There other opportunities for displaying the data by using PivotChart reports or highlighting specific information by using PivotTable reports. For more information about Excel PivotChart and PivotTable reports, see Overview of Excel charts (http://go.microsoft.com/fwlink/p/?LinkId=178194) and Overview of PivotTable reports (http://go.microsoft.com/fwlink/p/?LinkId=178195). This section helps you troubleshoot issues that you might encounter when you use OEAT. Create a Group Policy object (GPO) that sets Change permissions for the user on the following audit keys. For more information about how to set audit key values by using a GPO, see How to use Group Policy to audit registry keys in Windows Server 2003 (http://go.microsoft.com/fwlink/p/?LinkId=178196). Deploy OEAT to run under the Local System account on each client computer by using a management solution such as Systems Management Server or System Center Configuration Manager. Configure the tool to run from the Startup folder or Windows Run registry key, and then collect the scan results file from each client computer. This error message appears when client computers are running localized versions of Windows in which the names of security groups are not in English. The failure occurs because OEAT has a hard-coded dependency on the English name of the Everyone group. In clients that use a language version other than English, the Everyone group might be localized for the specific language of the client. On these clients, passive scanning fails. A new version of OEAT is available that fixes this issue. To download the new version, see Office 2010 Tool: Office Environment Assessment Tool (http://go.microsoft.com/fwlink/p/?linkid=171092). Customers have reported that in some environments, such as Citrix environments, scan results cannot be consolidated or compiled because the scan results file for each client uses the same file name. A new version of OEAT is available that uses GUIDs to ensure that scan result files use unique names. To download the new version, see Office 2010 Tool: Office Environment Assessment Tool (http://go.microsoft.com/fwlink/p/?linkid=171092). Proxy issues can prevent OEAT from downloading the vendors list (vendors.xml) on computers that have Internet access. If downloading the vendors list fails, use the procedure in Compile the scan results to download vendors.xml from a separate computer, such as a home computer, that does not use a proxy server. This error occurs when you are compiling OEAT scan results from a client computer that runs the English version of Excel and your current locale is configured for a language other than English. In this situation, Excel will try to locate the language pack for the configured language. If the language pack is not found, the error is reported. To work around this issue, change your locale to match the version of Excel that you are running on the client computer, and then try to compile the scan results again. This appendix describes OEAT command-line parameters and the locations where OEAT searches for add-ins and applications. You can run OEAT at the command prompt or in a script by using the set of parameters shown in the following table. Runs OEAT.exe with the scan option. This parameter requires that Settings.xml file is saved to the same folder as OEAT.exe. Runs the Setup wizard that creates the Settings.xml file. Compiles the scan result files into an XML file. This file is saved to the folder that is specified in the Settings.xml file. If no Settings.xml file exists, the default configuration is used and the compiled data is saved to a file in the current folder. Stops the scan if there is an error and displays a message box that describes the error. The settings file must be named settings.xml. The errors log file must be named errors.log. You do not need both the settings and error paths, but you cannot specify the errors path without specifying the settings path first. You can specify [default] for the settings.xml path to have OEAT use the one in the same folder the OEAT.EXE.